Written by CMOS Bulletin SCMO on November 7, 2018 . Posted in Climate, Weather, What's Current. Climate change is undeniable, and scientists around the world agree that in the coming decades the effects of a warming planet are only going to become more and more felt. What does climate change mean for Ontario? The development of the Ontario Climate Data Portal (OCDP) is intended to easily answer that question through the display of an array of possible scenarios. With an extensive and robust backdrop of climate model inputs, the OCDP provides maps, graphs and other interactive displays for Ontario based on the various greenhouse gas concentration trajectories adopted by the Intergovernmental Panel on Climate Change (IPCC). A wide range of climate projection data generated with various methods can be found in the public domain; however, users usually face a challenge on which data to choose and some do not even have the resources or expertise to collate the information into a form that meets their needs. To make the practitioners’ practices easier in applying climate data to their risk assessments and to promote consistency and comparability among climate risk assessments in Ontario, the Laboratory of Mathematical Parallel Systems (LAMPS) Climate Change Research Group at York University has developed a super ensemble of Ontario-specific high resolution (10km x 10km) regional climate data and disseminated these data on the Ontario Climate Data Portal (OCDP). This super ensemble is based on collectively 209 members from both global climate models (GCMs) and regional climate models (RCMs), including 47 members generated by dynamical downscaling from the North American Coordinated Regional Climate Downscaling Experiment (NA-CORDEX), University of Toronto and University of Regina, and 162 members generated by statistical downscaling from LAMPS and the Pacific Climate Impacts Consortium (PCIC). This ensemble accounts for all emission scenarios defined by the various greenhouse gas concentration trajectories adopted by the IPCC, referred to as Representative Concentration Pathways (RCPs). This includes 40(19.1%), 64(30.6%), 15(7.2%) and 90(43.1%) members under RCP 2.6, 4.5, 6.0 and 8.5, respectively. One major product of the OCDP is a set of probabilistic projections for both long term averages of the basic variables and extreme climate indices for 2050s (2040-2069) and 2080s (2070-2099) at provincial, regional, municipal and grid scales. All data have passed quality control and bias correction using latest sophisticated techniques. WHO IS THE OCDP FOR AND WHAT CAN IT DO FOR YOU? Figure 1. Here, the OCDP visualizes the current climactic conditions in the map, and listed in the table are the anticipated future climatic conditions under all IPCC RCPs (for at any selected location). The values in the table shown here are for a location close to the Aubrey Falls Provincial Park northwest of Sudbury, which could see as much as 5.5°C temperature rise by 2050s, and an 8.6°C temperature rise by 2080s under the IPCC’s business as usual (RPC 8.5) scenario. The OCDP was developed for users with all knowledge levels, and it consists of four main sections: maps, time-series, datasets and documents. In the maps section, we provided a provincial summary at the top of the page followed by interactive visualization of spatial distribution of climate change information for each variable’s annual, seasonal and monthly mean for both the historical period and projected changes in 2050s and 2080s relative to the reference period, along with the confidential interval (5~95%). As an example, figure 1 shows annual mean temperature and the changes under the four RCPs. The projected temporal variation of the variables were plotted as time series of annual anomaly (relative to the reference period (1986-2005) for provincial averages and decadal variations for each of the 50 regions and 150 municipals of Ontario from 1981 to 2099; all these interactive time-series figures are posted in the time-series section. For those who would like to carry out their own further analyses, over 10 terabytes (TB) of climate data behind the data section could be quickly download from either our cloud storages or database. Sample codes in several widely used data analysis languages (Python, R and Matlab) are provided to read the downloaded files. In the documents section, we provided practitioners some ready-to-use factsheets based on the data for their decision making; also in this section are some project reports users can use as template for their own studies. 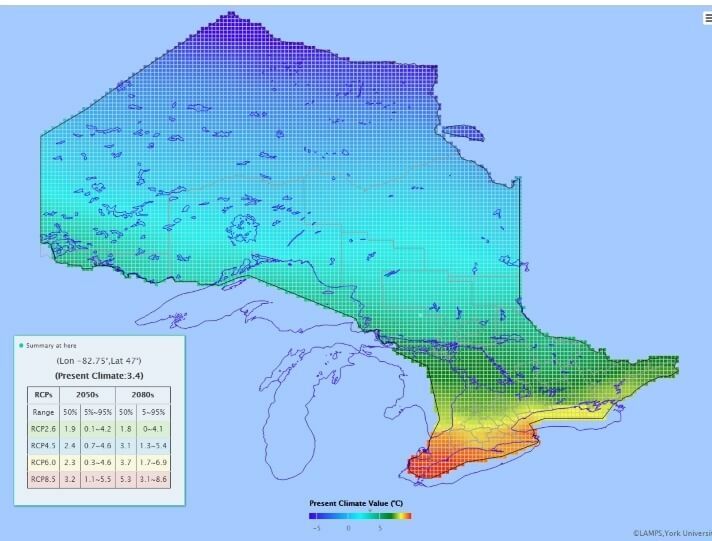 As an open source about Ontario-specific high resolution regional climate data in support of climate change adaptation in Ontario, the OCDP has attracted great interests of many users. According to the performance analysis by Google Analytics, users are mainly from, but not limited to, Ontario; traffic to the portal has jumped significantly since its official launch in June 2018, more than 7000 users have visited and downloaded data from the OCDP. Data from the OCDP have been used in various sectors for various purposes, including government policy development. We will continue to improve the OCDP to better serve our users. 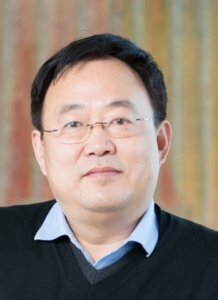 Dr. Huaiping Zhu is a Professor and York Research Chair in Applied Mathematics, and the Director of the Laboratory of Mathematical Parallel Systems (LAMPS) at York University. In addition to his expertise on dynamical systems, mathematical theories, models, and methodologies/tools for applications in biology, specifically prevention and control of mosquito-borne diseases, his Climate Change Research Group in LAMPS has carried out tremendous work in climate change modeling and impact studies in the past decade, resulting in the user-friendly OCDP and the large volume of climate data on it to support climate adaptation in Ontario. The authors would like to thank the Ontario Ministry of the Environment, Conservation and Parks (MECP) for its financial support to this project, although the content of this paper is solely the responsibility of the authors and does not necessarily represent the official views of the MECP.